A huge part of what makes The Yard’s locations so wonderful is the carefully curated art that brings the space to life. We’re grateful to have such talented artists as Billy The Artist and Vargas-Suarez Universal producing one of a kind art installations at The Yard, and curators like Lee Wells transforming The Yard’s walls into living art galleries. But who is the talented individual that pulls it all together – cultivating graceful consistency yet distinct personality within each space? The Yard’s Director of Aesthetics and Maintenance, Michaeline Sander. Michaeline oversees all things visual at The Yard, and, lucky for us, she’s contributing her creative touch in more way than one. Our newest installation at The Yard: Herald Square is a very special piece developed and produced by Michaeline. 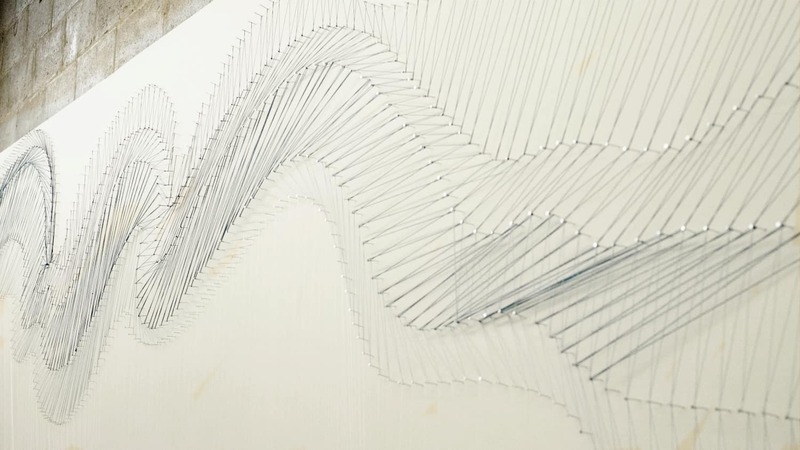 The piece, titled “Infinite Sway”, is comprised of blue and white strings systematically connected by nails. The genius in this thought-provoking piece lies in its simplicity and its continuity. Michaeline’s talents stretch across a vast plane of visual arts and design. Just one year ago, as Community Manager at The Yard: Lower East Side, Michaeline began honing her expertise. The ideas that she put into motion transformed the space into a magnetic environment that mirrored the creative lifestyle of the community. It was obvious from the start that Michaeline’s vision was invaluable. 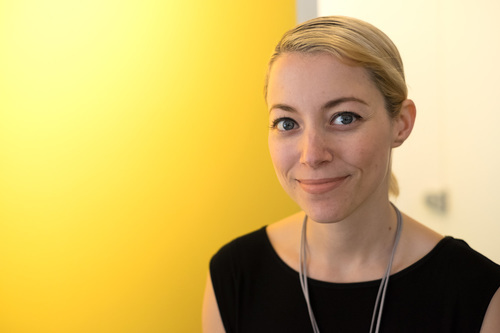 Today, as Director of Aesthetics and Maintenance, Michaeline manages the nitty gritty of every day building maintenance and develops the independent, yet connected, personalities of all of The Yard’s spaces. Her new, self-produced artwork at The Yard is just the beginning of the next chapter of Michaeline’s transformative aesthetics. The Yard is a living, breathing network of multitalented innovators with endless specializations. Not a day goes by that we aren’t impressed by the endeavors, collaborations and insights that surface within our space. Each of The Yard’s locations shines true to its neighborhood, with a unique layout, artwork and community, and each member contributes to The Yard’s vibrancy. Our newly adopted “Infinite Sway” is a beautiful new addition to The Yard: Herald Square, and experiencing the piece was a boost to a never-average Monday morning. We’d say we were pleasantly surprised, but innovation runs strong in this family.